Luke 10:38 Now as they were traveling along, He entered a village; and a woman named Martha welcomed Him into her home. 39 She had a sister called Mary, who was seated at the Lord's feet, listening to His word. 40 But Martha was distracted with all her preparations; and she came up to Him and said, "Lord, do You not care that my sister has left me to do all the serving alone? Then tell her to help me." But the Lord answered and said to her, "Martha, Martha, you are worried and bothered about so many things; 42 but only one thing is necessary, for Mary has chosen the good part, which shall not be taken away from her." "Surely if Jesus -- who has perfect knowledge -- reprimanded Martha, but not Mary, then I need to learn something from that, and not assume..."
I'm reminded that the scriptures are full of many layers and levels. Imagine that great scholars have poured over these passages for centuries, and yet they still hold meaning and interest for bible students. Many times there are different angles to the same story. The story of the prodigal son comes to mind. I once heard Josh Harris speak and he reminded us that while the prodigal had the money - he was having a good time!! Very true and it's an angle that doesn't get much play in Sunday School. I also remember the first time I heard Professor Scott Hahn speak of Abraham and his attempt to sacrifice Isaac. This occurred somewhere in Salem, which later became part of JeruSALEM. Indeed God sacrifices his son in a place where Abraham does not need to sacrifice his. The symbolism and meaning in that revelation is rich! So I took a fresh look at Martha and Mary. I noted, perhaps for the first time, that Martha is the one who invites Jesus in. She welcomes him. She opens her home and her heart to him. Wow... been there. Many times. Part of having a Domestic Church is trying to make sure that Jesus is welcome there as well as in the hearts of each family member. And maybe that's where Martha didn't follow through. Jesus does become a deep part of Mary's heart, and certainly her mind. I'm sure that's what Martha wanted for her sister. But at the same time, maybe she was jealous that she hadn't allowed Jesus into her own heart and mind as she had intended. She let the daily things take her away instead of moving her closer. I've done that too. Our parochial vicar gave a very educational homily on this last year. (See the archive section and look for Father L July 21, 2013). This incident with Mary, Martha and Jesus took place during the Jewish Feast of Sukkot, probably in late September or early October. It was a time of joyful celebration and abundance from the harvest time. The home of Mary and Martha was in the town of Bethany on the Jericho Highway and many hundreds of pilgrims were expected to travel the highway on their way to Jerusalem. Martha and everyone else in the village was getting ready for the hundreds of pilgrims by preparing meals and lodging for them. This was not just a simple dinner that Martha was preparing but a huge feast requiring a lot of time and effort. 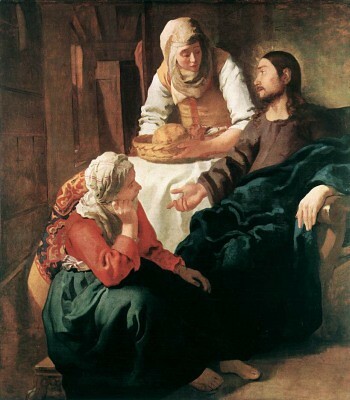 And I think part of what Father L was saying in his homily was perhaps that St. Martha wasn't as thankful as she could have been for the work and labors that she had to perform. As a wife and a mother I plead guilty to that as well - and am always trying to remind myself that this busy season of life is short and even though sometimes it is a tremendous responsibility, I should be thankful for the hardship that comes even with abundant blessing and learn the lessons from it that I need to learn for my own sanctification. The other part that strikes me is the part where she asks the Lord to "make my sister" do something. How many times I have asked God that my will be done instead of His?" Probably too numerous to count. God's not a puppet master. I'm sure prayers like that just make him shake his head. Mr. Pete had an interesting thought of his own on Martha and Mary. He thinks Jesus probably let the ladies work it out in sisterly love while he sought out the company of Lazarus! Maybe the Lord lets us heal ourselves that way too. I;m just guessing you've done the "make my sister do something" a few times though . . . . .
Yea. The latest one was, "Let her be OK!!" said as I was rushing down to Wooster on Mother's Day!